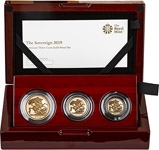 Our selection of 2019 sovereigns from The Royal Mint. Available in bullion and proof finishes, and sizes ranging from a quarter up to a quintuple sovereign. These investible coins feature the iconic St George and the Dragon design on the reverse. If you're looking to buy bullion, we have a dedicated page for bullion sovereigns. Track the intrinsic price of a sovereign using our live gold price chart.